The fourth largest university in the UK, Sheffield Hallam employs over 4,300 staff for more than 35,000 students, with a turnover exceeding £230 million a year. The administrative strain on the university’s purchase card team was preventing them from taking advantage of process efficiencies. With numerous suppliers and 400 purchasing cards, the university’s manual system was proving time consuming and arduous. They chose Fraedom to ease the administrative burden and provide greater insight into spend. Automated expense processes, reducing duplications and minimising errors. 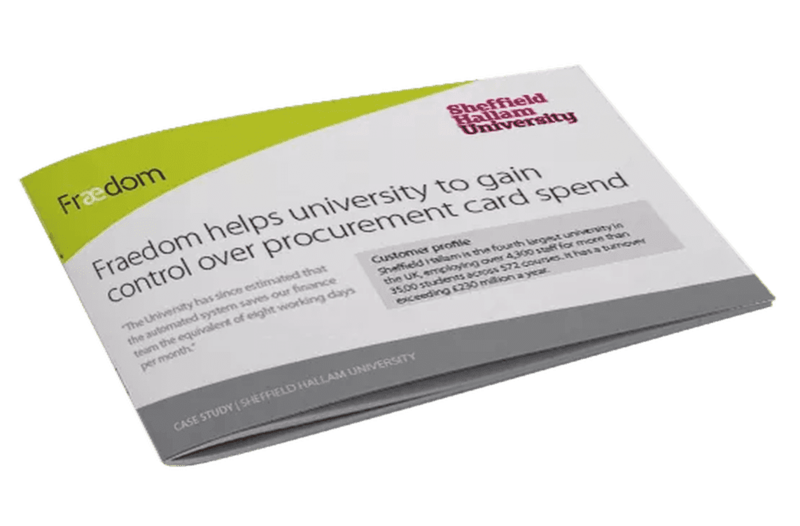 After a vendor audit, Sheffield Hallam selected Fraedom’s expense management platform over competitors, as it offered the greatest flexibility across all types of expenditure. The finance team at the University was also impressed with the approach Fraedom took in identifying the right solution for them during the pitch process.